Here we are with a somewhat 'refreshed' issue of Hyakunin Issho! Almost everything inside is a 'new series', or at least something you probably won't have seen before. As you know, my workshop windows overlook a small stream, and over on the other side there is a small kind of shrine building where neighbourhood residents stroll to walk their dogs. The other day one lady chatted with me when I met her out on the street, "Bull-san you work so late at night; everytime I walk my dogs down there, no matter how late in the evening, your workshop light is always on, and I can see you in there hunched over your bench ..."
Each year at the exhibition I prepare a wall display consisting of clippings from news stories on my work that appeared in the previous year. Over the 16 years that have elapsed since I first made my work publicly available, the media here in Japan has been wonderfully supportive of my activities, and the display has grown larger and larger. To some extent, this is because 'the Japanese' find the idea of a foreigner working in traditional crafts unusual enough to be worthy of comment, but I do like to think that if a 'typical Japanese guy' had done similar projects, then his work too would be considered 'newsworthy'. Although I myself ask for a lot of this coverage by sending out publicity materials in the months preceding each exhibition, some of it also comes 'out of the blue' as editors see or hear about my work somewhere and think that it would suit their needs. I almost always reply positively to requests for print media interviews, but have to be somewhat more selective in the case of TV, as some of the offers that come in are for venues that are not particularly conducive to quiet contemplation of my work, to put it mildly! 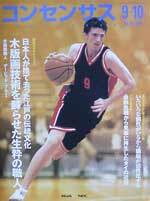 This is my third appearance in this magazine. Although the main purpose of the publication is to provide 'Help Wanted' advertisements for those looking for jobs, they also run stories that showcase people working in a variety of occupations. I noticed though, that in this issue there were no ads looking for printmaking craftsmen! "My ability to see has also changed; the prints I made some time ago come to seem like 'junk'. The best I can do today, just becomes 'junk' later. But I'll just keep trying as long as I can - always trying to do better work than the day before. If you keep on doing the same thing long enough, you're bound to get better at it! That recipe makes for a happy life!" Writer: "In David's view, the printmaking craftsmen at the turn of the Edo-Meiji periods reached the absolute acme of the craft." 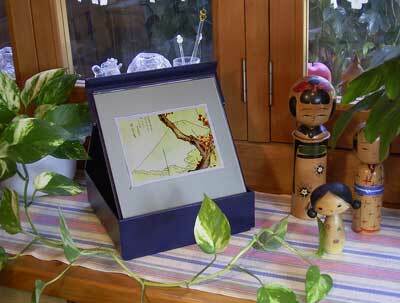 Dave: "Japanese woodblock prints are completely different from those of China or Korea. Europe also has a woodblock printmaking tradition, but it seems the Japanese craftsmen didn't use these influences. Japanese woodblock prints truly were created and developed in this country; we really can say they are 'Made in Japan'!" 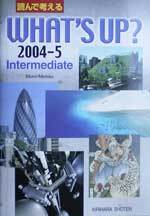 'I am a Craftsman, not an Artist', What's Up?, 2004-5 issue. 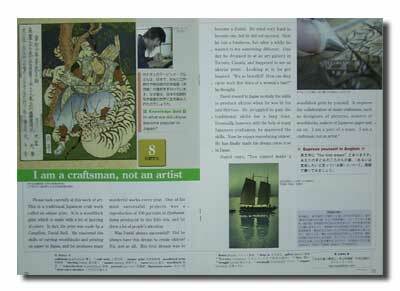 Not a magazine, but an English textbook for high school students. I was very happy to cooperate with this publisher, as I think it is important to expose young people to the idea that it is indeed possible to make a living with traditional arts and crafts. 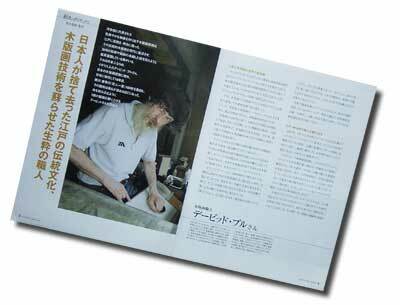 Quote: "David moved to Japan to study the skills to produce ukiyo-e when he was in his mid-thirties. He struggled to gain the traditional skills for a long time. Eventually, however, with the help of many Japanese craftsmen, he mastered the skills. Now he enjoys reproducing ukiyo-e. He has finally made his dream come true in Japan." Prime-time programs of this sort are famous for extreme 'quick cutting' and for cramming as much information as possible into a short space, but even though there isn't much depth to the content as a result of this, I'm still happy for the opportunity for a wide range of people to come into contact with my work. Q. "So of course I guess you are concerned about preserving Japanese traditional culture?" A. "I don't think about that sort of thing so much. Why am I doing this? Basically, just because I like it! Any tradition will be maintained naturally, as long as we have both sides: people making things, and people using things; that's the best way I think." 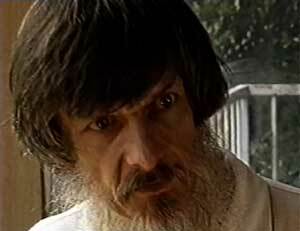 This program was much more 'peaceful' and carefully prepared, a 15 minute 'mini-documentary actually. 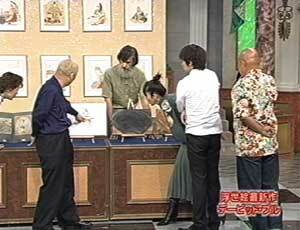 NHK is very thorough, and this program took a lot of preparation time, more than I could really afford to spend. But after the broadcast, I learned that it had been worthwhile, as reaction from viewers was very positive and appreciative. "It's difficult to believe that somebody could have actually made this - such incredibly fine carving, the delicate colouring, the beautiful paper ... It's absolutely unbelievable. There is also woodblock printmaking where I come from, but it is completely different ..."
"If these lines aren't carved smoothly and cleanly they would be strange. But if they are too clean, that is also wrong. To create the most natural line, the knife must move ... steadily and effortlessly." Narrator: "Challenging the techniques of a hundred years ago; at the present time, just how certain things were carved has become lost. The way these lines are carved to look like natural brush strokes, for example. 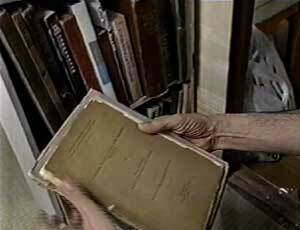 The answers may be in these old books." David: "The books on these shelves are my teachers. We can read descriptions of the Meiji printmaking process; some of them quite detailed." 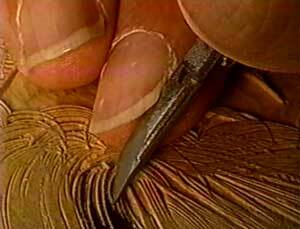 Narrator: "In this book, the technique of carving brush strokes is mentioned, but not the actual method of how it was done. There is only one way forward - trial and error. Exploring these unknown techniques is one of the most interesting parts of his job, David told us." That's all we have room for this time ... I wonder what the next phone call will bring, and what I'll be able to include in this space a year from now? Visitors to my most recent two exhibitions in Tokyo have enjoyed seeing the David's Choice corner of the show - the place where I display a group of woodblock prints from my own collection. I have a lot of fun selecting the prints for this corner; I particularly like choosing items that one would probably never see in a typical print exhibition - the kind of thing that will bring a reaction of "Is that really a woodblock print?" But as many readers of this newsletter don't live close enough to make it to the Tokyo exhibitions, I think it's time to introduce some of these prints here in Hyakunin Issho. Notes: the prints were previously glued down into an album, but I was able to 'rescue' them from the cardboard backing sheets. A gorgeous print, from one of the best of the Meiji designers, issued by the premier print publisher of the era - I can't think of a better way to start off this year's David's Choice selection! I like Gekko a lot, and the more I learn about his life and work, the more I like him. He was almost completely self-trained, something I can certainly relate to, and seems to have succeeded as a designer by lifting himself up from nothing, rather than being part of a 'school'. In my early days in Japan I was told that 'self-promotion' is discouraged in this society, but when I read that Gekko prepared flyers and took them around to various publishers to sell his services as a designer, I think that perhaps he and I would have got along together! He was also one of the earliest Japanese artists to gain recognition in the West, through his numerous illustrations for books in foreign languages, and exhibitions of his prints overseas. This 'Beauties' series is one of his major works, and every one of the designs is a wonderful treasure. Triptychs of bijin-ga were common in the Edo era, but they were usually simply 'parades' of women from the Yoshiwara. Here, Gekko clumps the women up together to form the center of a completely realistic scene. 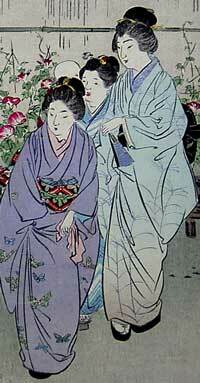 Look at the delicacy of the gradation on the kimono of the woman on the right! Sumptuous! 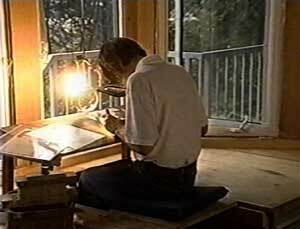 Back in the 'old days' woodblock printing was of course used for much more than making 'art'. 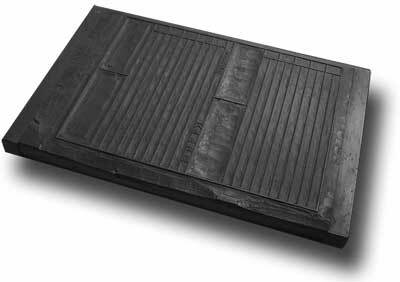 Before presses were introduced from the west, anything that needed to be produced in multiple copies was carved onto a woodblock and then printed by hand with a baren. The sheet you see here is a typical example - a blank form to keep records of some kind. Companies needing such forms contacted local print shops to provide them, just as they do today. But where these days the print shop worker would sit down at his computer terminal to do the layout and then send the file through to a printing press, back then each job had to be carved on a separate block, which was then passed to the waiting printer. 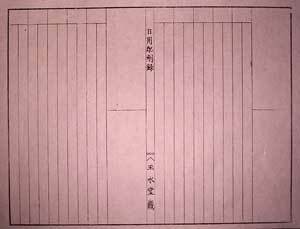 After the requisite number of forms was printed, the block would be stored there at the printing shop ready for use when that customer needed more copies. Storage of a mountain of such blocks must have been a real problem for local print shops, especially those located in crowded downtown areas. It's interesting to note too, that when you look at the reverse side of the block, you can see the vivid marks left by the large saw with which the cherry log was sawn into planks ... of course by hand. What would those men - who did everything by hand - think of us, who now have it all done for us by machines? It seems just a few months ago that I was introducing a new series in this newsletter ... actually, it was only a few months ago! But with the Beauties of Four Seasons series now wrapped up, it's time to get the next one underway! Back at the end of 1989 - the first year of work on my Hyakunin Isshu series - I had to decide what to do about sending a New Year greeting to the subscribers. I knew about the Japanese tradition of nengajo (new year greeting cards), but didn't feel so comfortable about using the traditional zodiac themes (I have a dislike of astrological traditions that purport to control or influence our character or actions). I also didn't want to make a standard type nengajo, because postcards - thick enough to go through the mail - are too stiff and hard for delicate printing. So I started the custom of making a 'new year greeting print', a small print the same size as the traditional nengajo, but printed on delicate washi, and sent to the recipients in an envelope. Luckily for me, the Japanese post office allows New Year greetings to be sent in envelopes, as long as they are visibly stamped nenga. Most of the new year prints I have made are not specifically themed as such, but are simply designs that I thought would make attractive small gifts for our friends. They have been well received over the years, and I have had many many requests to make more such prints available. I think it's time to respond to those requests, so am now announcing a one-year series for 2005, the Hanga Treasure Chest - a collection of postcard-size prints. There will be 24 small prints in the series; I will send one out every second week, timed to arrive in mailboxes within Japan every second Monday. Together with the first print, collectors will receive an elegant little box in which to store the entire set (made by the same people who created the wonderful storage case for the Beauties series). In what I think is a very nice touch, the storage box has a built-in stand on which the most recent print can be displayed (special thanks to collector Julio Rodriguez in Chicago for this idea!). The stand is a clear acrylic, and the print will be quite safe during the two weeks that it is being displayed. When not needed, the stand folds invisibly down into the box. Each print will arrive wrapped in a small storage folder containing details and a short 'story' on the print. The price per print will be 2,000 yen plus shipping (240 yen within Japan, 330 yen anywhere else in the world). 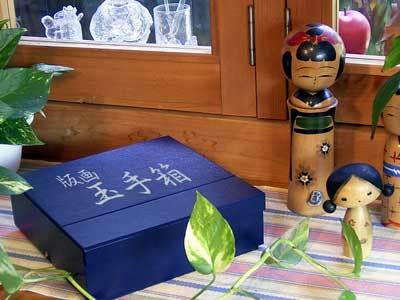 Residents of Japan must also add Consumption Tax. Because making payment every 14 days would be inconvenient, I am quite happy to let people 'batch' the payments. An invoice accompanying each print will show a chart of just which prints in the set of 24 have been paid for; collectors can make 'batch' payments anytime at whatever frequency best suits them - monthly, bi-monthly, etc. The set of images will have no specific theme, but will cover a wide range of styles and types; some will be reproductions, others will be ideas 'borrowed' from here and there, and who knows, perhaps there will even be some originals in there somewhere! David had interviewers as guests today. Recently he is often featured in magazines aimed at young people as a person who lives a unique life. I wonder how young readers react when they read about him? While I was thinking about this I recalled an incident that happened more than 20 years ago. When my daughters were elementary school students I volunteered as a PTA organizer for a year. During that period, PTA members from local schools invited a certain college professor for a lecture. As the preparations progressed, the organizers found that there weren't going to be many attendees, and other parents were encouraged to come along to fill the empty spaces. So that evening I reluctantly went to the meeting place. The lecture was held in a room of the local high school, and the audience - made up mostly of such conscripted parents - filled no more than half the room. When the time arrived, the invited lecturer came into the room holding his materials in a Japanese wrapping cloth. What did he speak about? He talked about what kind of child has a successful life. He used the phrase 'successful life' quite frequently. I was a bit confused right from the beginning of his talk because he didn't define what he meant by this. I wanted to ask, "Excuse me sir, what do you mean by 'successful life? ", but as I patiently listened to his speech I gradually came to understand what he meant. It seemed that success in life was demonstrated by becoming rich ! Oh, no no no! I no longer wanted to continue listening to his speech. I also thought about his students at the college. What do they take from his lectures? In contrast to this, what kind of message is David sending to young people in his interviews? Maybe he says "When you are young it's inevitable that you'll come up against things you can't handle, or things you fail at. But once you find what you are really interested in, follow it with all your capacity." He himself actually lives happily and enthusiastically by making woodblock prints, which he was fated to encounter and with which he fell in love. In order to continue making woodblock prints he will climb over whatever barriers come before him, because he loves this work so much. It seems he enjoys his life as though he is surfing in a huge ocean. He sometimes surfs forcefully along a big wave and sometimes he is almost swallowed by a normal size wave. I guess he has no time to think about such a thing as a 'successful life'! I am now in my mid-50's and sometimes become pessimistic, thinking that if I have climbed up to a summit in my life, there is only a downward slope remaining for me. Once I said to him, "I am rolling down towards the end of my life!" He replied, "But think about it this way! I am 54 years old now. Let's say I live to be 84, that would mean 30 more years. 30 years is the same amount of time I have used from age 24 until now, so that means I still have enough time to do all the kinds of things that I have filled those years with! Isn't it wonderful?" You can probably guess what he will be saying when he is 84 years old; "Well, if I can live 'till 104 ...."
In the previous issue of this newsletter I wrote on this page, "... if there are any of you collectors who may be able to help us out with the set-up job, please let us know!" I had hoped that a few of you would be free that day and would be willing to drop down and give a hand, and I was right - it now seems that we will have a good 'crew' to do the set-up. (Sadako and I will have to carefully prepare everything in advance, so that each person will have a clear job to do ...). Thank you very much to these volunteers! But a week or so after mailing that request for assistance, I also had two replies that I hadn't expected - offers of assistance to help with the set-up job came in from both Germany and Canada! Perhaps you can guess what happened; my brother in Germany saw my request, phoned my parents in Vancouver Canada, and arranged for the three of them to come over to help out! Of course that's not the only reason they are coming; it has been a full six years since they were here for the final exhibition of the Hyakunin Isshu series, and they think it's about time for another visit. Unfortunately, it won't be as full a 'reunion' as it was at that time because neither of my daughters can make it: Himi-chan is working on the cruise ships in the Caribbean, and Fumi-chan is very busy with her college studies in Vancouver.